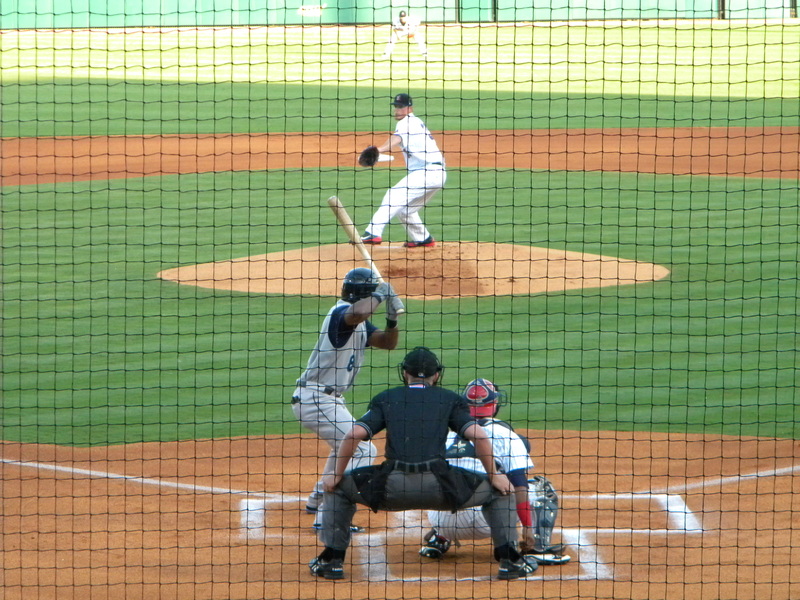 Hooks CF Austin Wates leads off the game against Travs righty Matt Oye. He would single and come around to score the game’s first run. 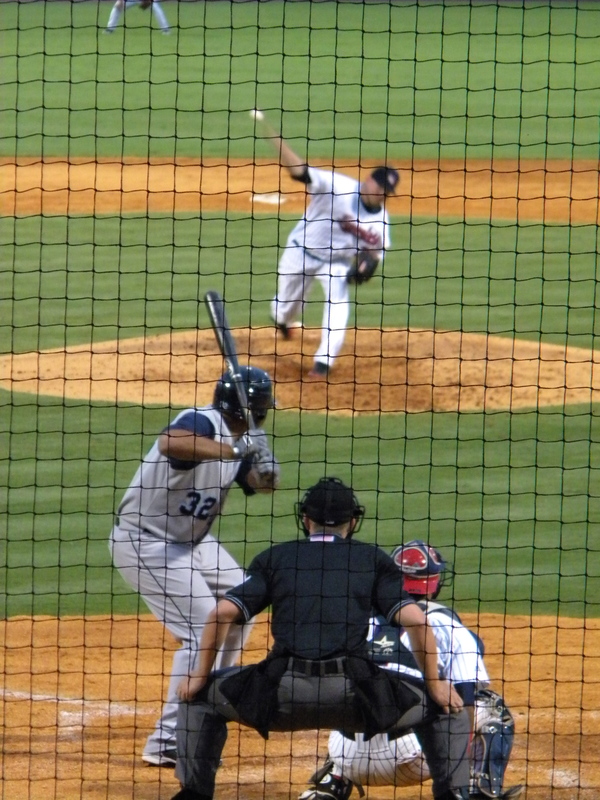 Just back off the DL, Hooks C Chris Wallace bats in the 2nd. And just in from Extended Spring Training, 3B Brandon Wikoff follows with a single. 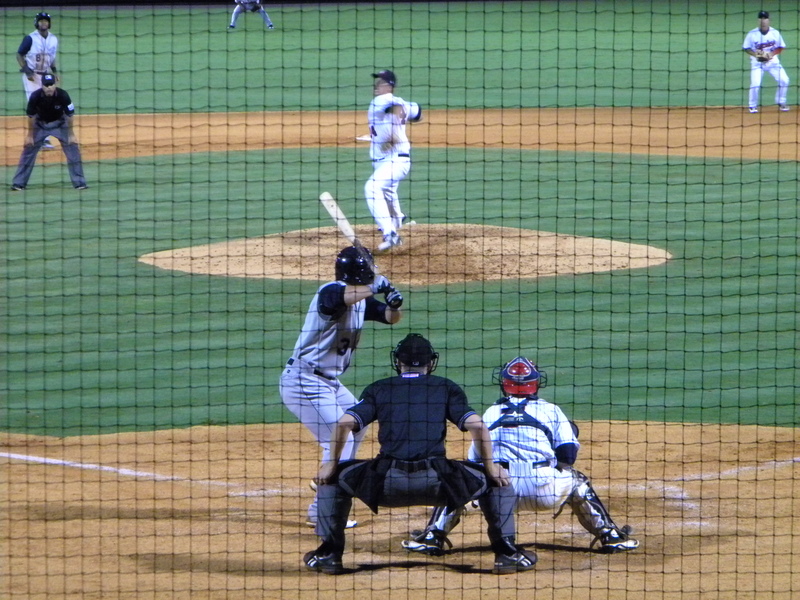 Kody Hinze DH’d and hit 8th this night. After a solid 2011, he’s struggled so far this year. 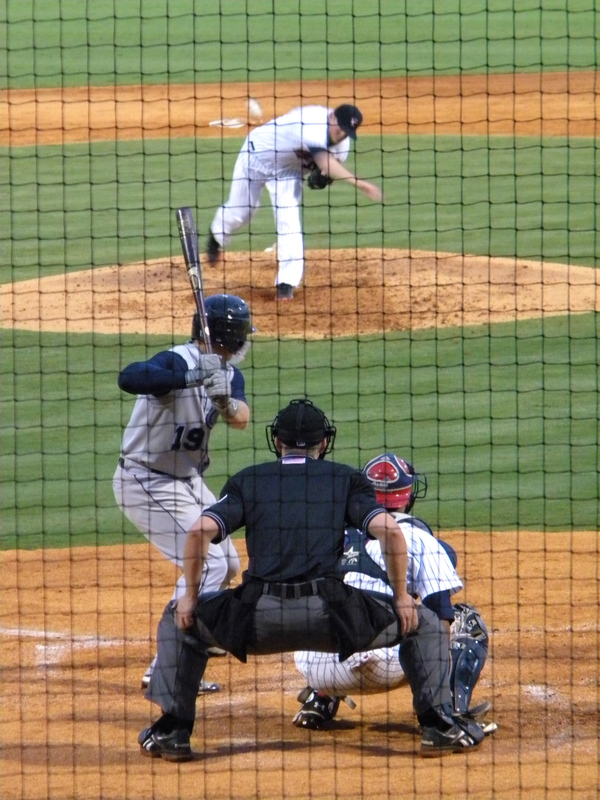 Hooks starter Ross Seaton attempts a pickoff to first in the 5th. 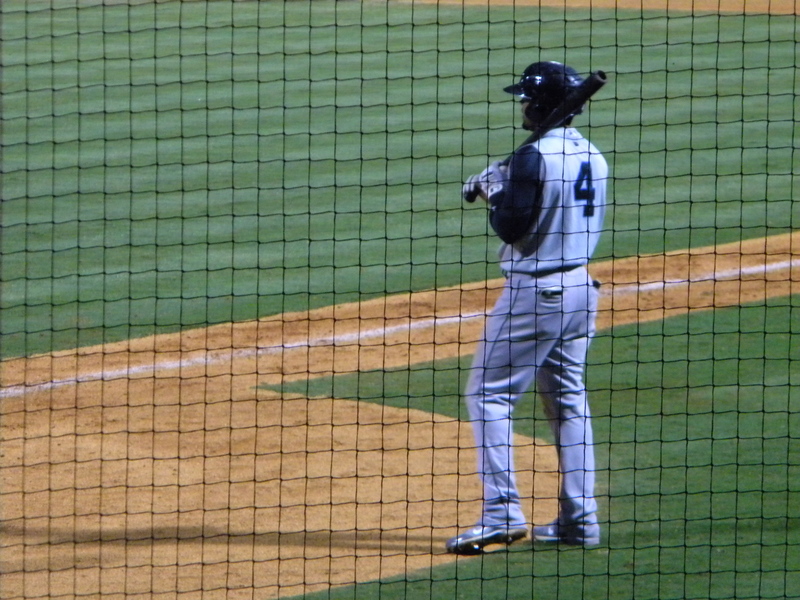 The batter is Travs SS Jean Segura, one of the Angels’ top prospects this year. 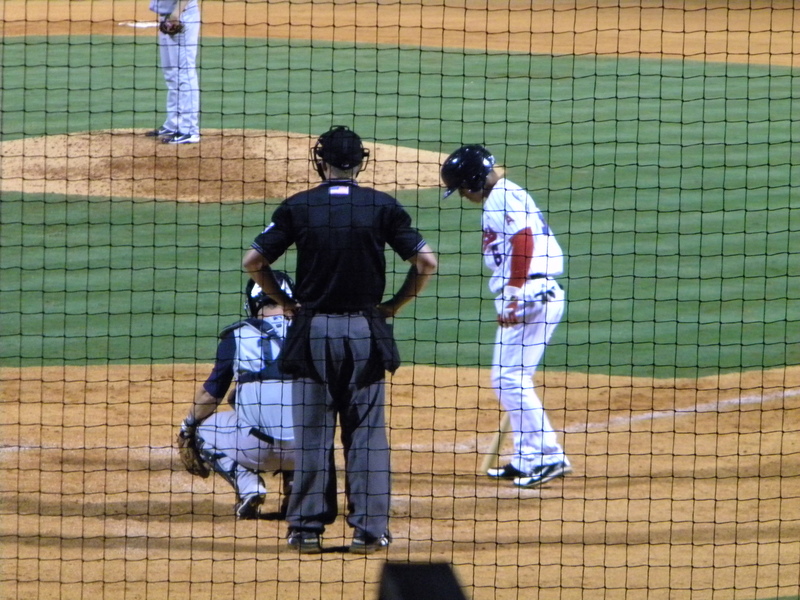 Not the best photo, but RF Andy Simunic was the star of this game. He gunned a runner down at the plate moments before this to end the 5th, then later made a heads-up steal of third that led to the winning run. 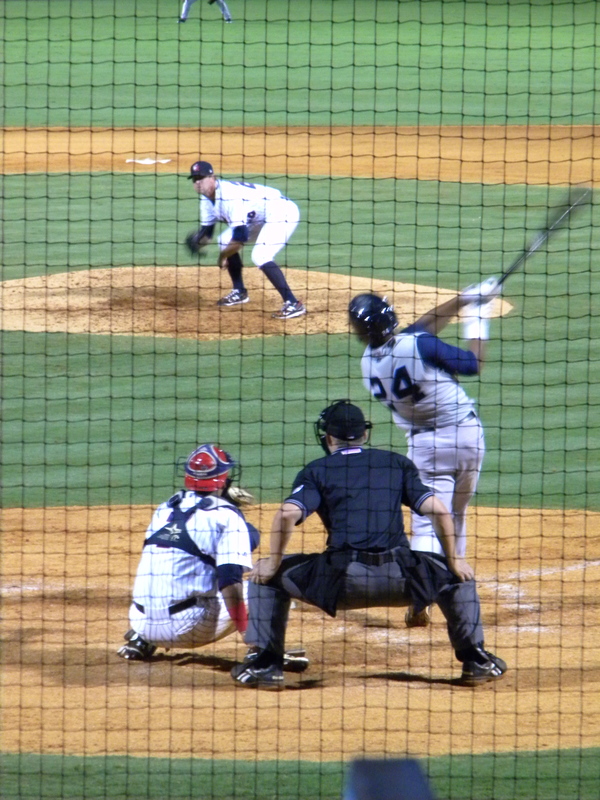 Hooks SS Jonathan Villar awaits his turn at the plate. He looked overmatched when I saw him last August, but he’s looking much better now. 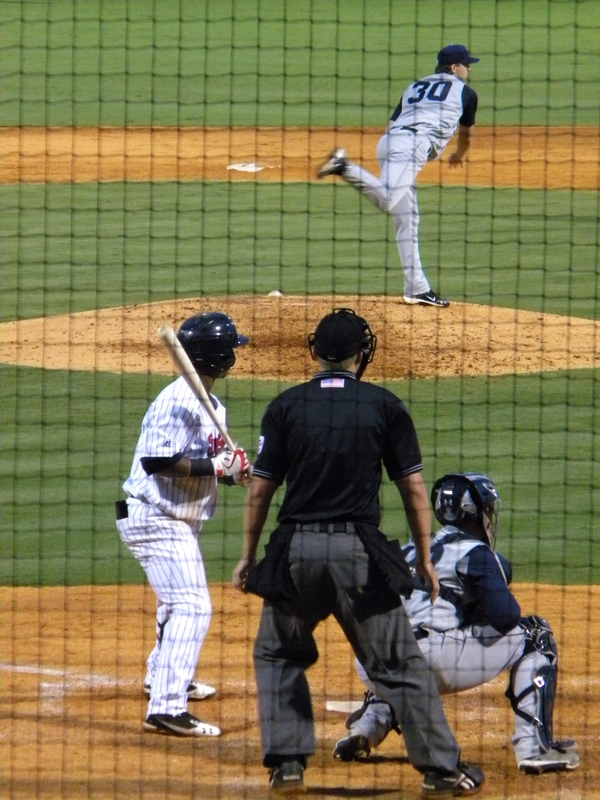 Hooks 2B Jose Martinez readies for the pitch. 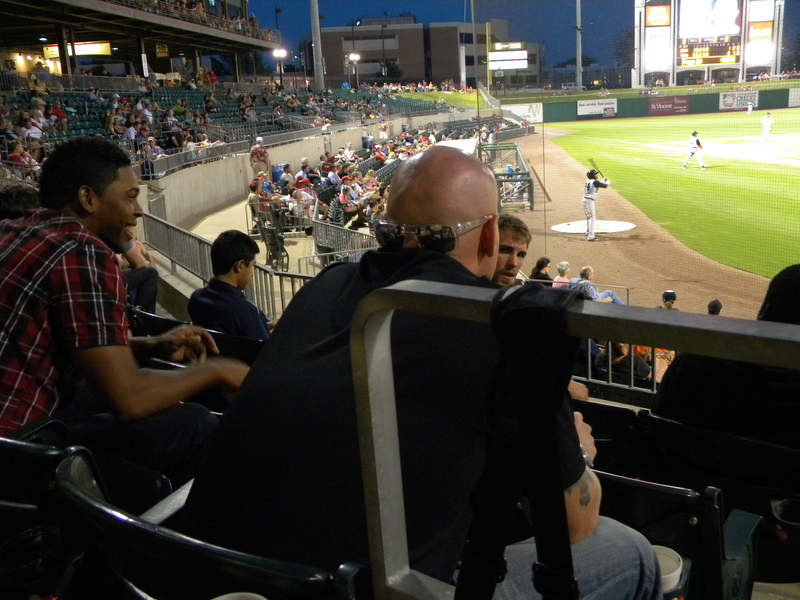 This, ladies & gentlemen, is the back of Brett Oberholtzer’s head. On the left in plaid is Jose Cisnero. Brett was really nice and chatted with us periodically throughout the game, but they were there to track the Hooks’ pitches, so I tried not to bother him too much. 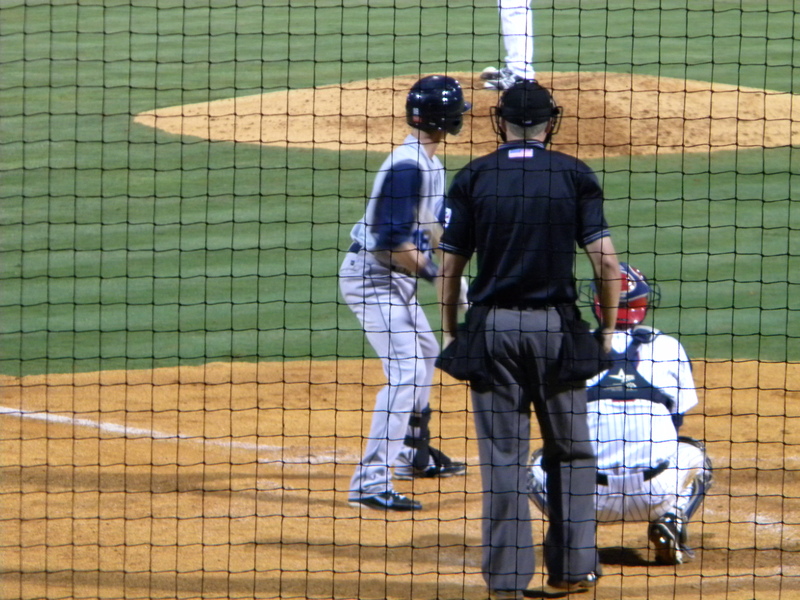 This is Arkansas fan favorite Darwin Perez, the Travs’ own diminutive 2B. He’s listed at 5′ 10″, but that’s generous. Astros 1B of the future Jonathan Singleton launches one deep to left center for a game-tying solo shot in the 7th. This was his first HR against a lefty in 2012. 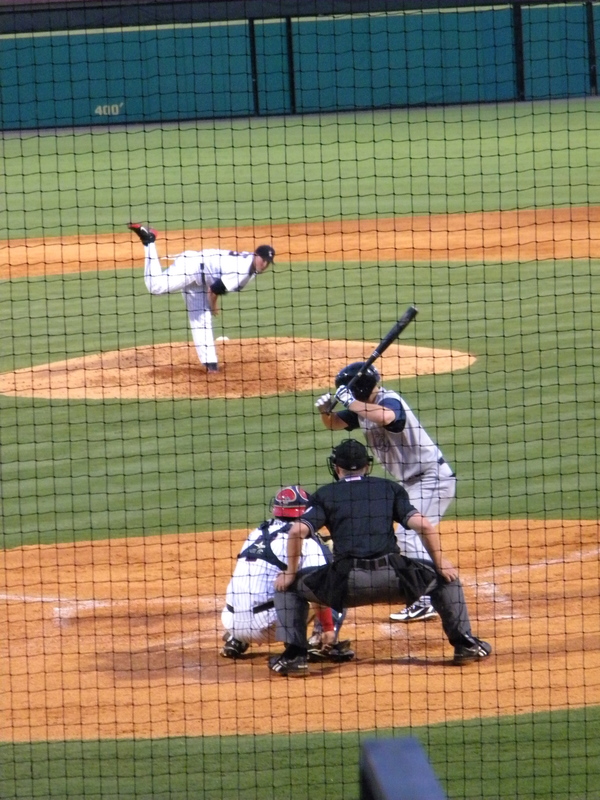 Ultimately the Hooks won 3-2, and it was a great night. If circumstances allow, we’re hoping to make it out again for the series conclusion Friday night, with Oberholtzer on the mound. I’ve tried to be a Carlos Lee supporter. I don’t hate Carlos Lee. Compared to the loathing for him spewed by many Astros fans since the start of last season, I’ve been downright cuddly with the guy. But enough is enough. His time as an Astro needs to come to an end – now. I’m more upset by the Chris Johnson/Brett Wallace demotions than I am by the Hunter Pence/Michael Bourn trades. I understand the demotions from a purely performance or playing time perspective: Chris Johnson just suffered through an awful July with a .574 OPS. Brett Wallace posted an even worse .433 OPS over the same stretch. Neither of the two is a particularly great defender (although Wallace is at least adequate), and if you can’t hit and you can’t field, you don’t belong in the big leagues. But if the Astros’ trades this month have indicated anything, it’s that they’re very clearly trying to get younger and planning for the future. Both Johnson and Wallace still have a good chance of being a part of that future. Carlos Lee, on the other hand, does not. Wallace was sent down because J.D. Martinez was called up. I’m excited that J.D. is here. But not at Brett’s expense. I realize that the overwhelming majority of Martinez’ outfield experience is in left, and that the same is true of Carlos Lee. It wouldn’t really be fair, or wise, to call up Martinez straight from AA and then expect him to adjust to big league pitching and to a new position at the same time. But that pushes Lee out of left. The only other place you can put Lee is at first base, which pushes Wallace to the bench, and that’s not fair or wise for a young player, either. So I’d rather see Wallace play every day at AAA than ride the bench in Houston. But I’d really rather see Wallace play every day in Houston, and see Carlos Lee cut loose. It’s true that Lee has been a better hitter than Wallace for the majority of the season. Since an awful April in which Carlos hit .194, he’s posted an .824 OPS over the next three months. Compare that to an .828 OPS for Pence this season, and an .831 OPS for Lee in his last “good” season of 2009. Minus the home run power, El Caballo seems to have regained his stroke. But he’s also 35 years old this year, and he’ll be 36 in 2012 for the final year of his contract, and there’s no way on Earth that he’ll be a part of the Astros team after that. They’re on the hook for the remainder of his salary whether he plays here or not. So if they’re really dedicated to this youth movement, if they’re really dedicated to the future, then why keep giving at bats to a guy who has no chance to be a part of that? It may be that the Astros’ hands are genuinely tied in the matter. Even if it wasn’t for his massive contract making him undesirable, Lee has full no-trade protection, and with his cattle ranch in Houston, he’s not inclined to go anywhere. Ed Wade may have asked him to waive his no-trade clause, and Carlos may have flat out refused. That’s his right. But everyone that knows Carlos personally will talk about what a nice guy he is… so why not do something for the good of the team? Does he really want to be the only 35-year-old on a team full of 25-and-unders? A team that’s buried in the cellar this year, that probably won’t be much better next year, with no shot at the postseason before he’s forced to sign elsewhere anyway? If the Astros will eat a healthy chunk of the salary they’ll be paying regardless, there are contenders out there that would love to add a bat like Lee’s for the stretch run. His only taste of the playoffs so far was when he was a 24-year-old sophomore himself back in 2000, and his White Sox got swept in three games by Seattle. Wouldn’t he like another shot at the World Series? There’s no better time for that than now. I realize that no team likes to pay a guy to play elsewhere. But it makes sense for the Astros to try and do just that in Lee’s case. If they’ll agree to pay two-thirds, or three-fourths, or even nine-tenths of his remaining salary, they’ll still save themselves a few million dollars and likely be able to get a prospect or two in return – guys that would have a chance to be a part of Houston’s next winner. I don’t mind Brett Wallace’s AAA exile so much if the Astros are actively shopping Lee in the meantime. There’s no safer bet to clear waivers this month than Carlos, so a trade could – and should – still happen. Maybe it will take Jim Crane’s new ownership for that to happen, but Crane should officially take over this month too. It would be better to get even long-shot prospects in return for Lee than nothing at all. But it will be better for the long-term health of this club either way to let Wallace man first base in Houston than to leave him (or J.D. Martinez) stuck behind Carlos Lee for another year. If Lee adamantly refuses a trade, then be bold and just cut him loose. Maybe Wallace isn’t the long-term answer at first base; maybe Kody Hinze or Jonathon Singleton is. Maybe Chris Johnson isn’t the long-term answer at third, either, and maybe Jimmy Paredes is. But we won’t know until we let them play, and Wallace and Johnson are more ready for the big leagues now than Paredes or Hinze are. Yes, Brett and CJ have had their struggles, but they’ve shown signs of something better, too. By the time that Hinze and Paredes genuinely are ready for the big leagues, we should know about Wallace and Johnson for sure. As long as there’s not anyone standing in their way. When Carlos Lee was signed to his big contract, the Astros were just one year removed from the World Series and had only missed the playoffs in 2006 on the final day of the season. They’re in a much different place now, and Lee’s place on this team no longer makes any sense. Kudos to you, El Caballo, and thanks for some great moments. But it’s time to ride off into the Houston sunset.